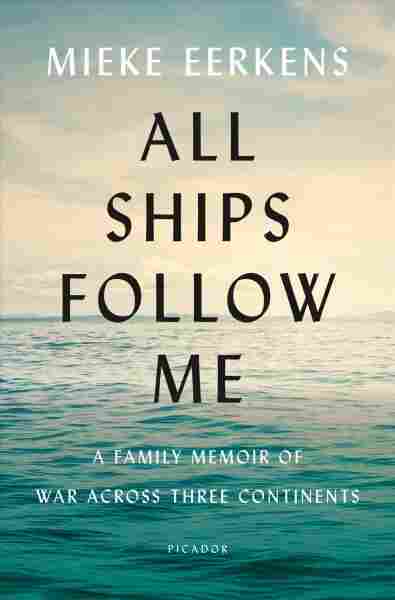 'All Ships Follow Me' Rustles Up Questions About The Privilege To Be Heard Mieke Eerkens has written an engrossing memoir on the interesting, even inspiring, stories of her parents after WWII. Yet despite its careful questioning and analysis, it's an uncomfortable read. The existence of All Ships Follow Me presents a series of problems. The book itself is unimpeachably competent; Mieke Eerkens has an impressive pedigree as a writer, and this engrossing debut memoir proves out her training as well as the years of sustained effort she must have undertaken to write it. However, the sheer fact of the book rustles up troubling questions about memory, vengeance, oppression and the privilege to be heard. Whole libraries of literature, entire museums, are devoted to the memories of those who died in the Holocaust and those who fought on behalf of the Allies. However, Eerkens' parents — the subjects of her memoir — suffered ambiguously compared with these clear-cut horrors. Her father, Jeff, was the child of Dutch people living in Indonesia, the descendants of white colonists from centuries past. Jeff spent the war in what amounted to a POW camp run by Japanese officers, subjected to abuse and starvation. Eerkens' mother, Else, was the child of a man enlisted in the National Socialist Party of the Netherlands. After the war, Else's family splintered and her parents both served prison terms because of their affiliation with the party. In three parts, All Ships Follow Me tells the stories of Jeff, Else and the family they created in Southern California, away from these sad histories. Both of Eerkens' parents come from the side of the oppressors, later defeated, in their separate conflicts: Jeff, from white people settled in Indonesia, and Else, from Dutch citizens who sided with fascism. Both were children at the time of the war, which means they partook in disgrace not of their making. Also, their families' crimes were mild at best; Jeff's father was a doctor, not a rubber baron, and Else's father did not endorse what the German National Socialist Party did. Eerkens never argues for her family's total blamelessness in these oppressive, deadly conflicts. "My father was a colonist, part of a system of colonialism that his father and his father's father were part of," she states. Of her mother's father, she writes, "those who support fascism usually fail to recognize that they are supporting fascism until it is too late. ... At what point does naiveté become negligence?" Despite these admissions, the book is an uncomfortable read. Eerkens effectively illustrates the hardships undergone by each of her parents at the hands of their enemies and the difficulty of remaking a life after one's home no longer exists. Indonesia used postwar instability as an opportunity to declare independence, rendering Jeff and his family unsafe. After the war, Jeff is marched onto a ship bound for the Netherlands, where he had never set foot. This is objectively sad, that a boy, having just spent three years in atrocious camp conditions, is forcibly uprooted to a land where he doesn't belong. But the root cause of this sorrow is injustice perpetrated by Jeff's ancestors. Whether or not the reader believes in vengeance as a tool for justice will have a lot to do with how much she can sympathize with his story. In the same way, Eerkens' narration of how her mother lived after the war is difficult to accept uncritically. Else and her sisters are passed from home to home while her parents serve out their prison terms. Her mother, given a shorter sentence, builds a life for her children out of sweat and blood after she is freed. Even after her father is released, the whole family undergoes hardship. It is genuinely awful to grow up this way. Given the minimal involvement her parents had with the party, it's not fair that they were treated like lepers — no one would hire them, no one would lodge them, no one would grant them credit. But this unfairness pales in comparison with entire families, entire towns, wiped out across Europe. "While the direct victims of the Nazis had government-sponsored therapy and organizations to help them attempt to recover from their trauma beginning immediately after the war, for a long time it was not acknowledged that the children of collaborators were indirect victims of the Nazis too." This quote is not without pages of context, and a great many well-tuned sentences explaining the soul-searching it has taken for Eerkens to write it. She argues that history should not be rendered in extremes, that war harms everyone swept up in it, and that "we should be able to hold two truths at once." All of which is true. But comparing Holocaust survivors to the children of Nazi collaborators is not the only quote to put a bad taste in the reader's mouth: "I find it frustrating that I must always grapple with the evils of colonialism first when writing about my father's war experience at the hands of the Japanese." Can the people who lived and died under those evils for centuries have sympathy for her frustration? The voices of those who cannot tell their stories create a deafening silence, one Eerkens breaks, for better or worse, by telling her own. Of course, there ought to be room in the world for stories from all narrative angles of a war. Perhaps seven or eight decades is enough time that those other angles can start appearing without the reader feeling uneasy. The surest way to repeat history is not to read it; forgetting the existence of men like Eerkens' grandfather, who joined the party out of idealism and then couldn't extricate himself when he perceived its horrific direction, is how we find ourselves in complicity with fascism seven or eight decades later. And certainly there is no shortage of Holocaust memoirs and histories, no failure to recognize what Europe both suffered and perpetrated during those years. In this one case, the oppressed side of the story has been adequately told. Yet some conflicts are simply too harmful to gin up sympathy for the oppressor. (Does the world want a nuanced memoir of a Southern family that lived in wealth and comfort until about 1861, after which it faced the destruction of the only world it had known?) Some bad choices, some trauma, whether cultural or individual, may be better laid quietly to rest than drawn out into the day, where the light of judgment shines so brightly, so harshly. All Ships Follow Me is a well-written, well-paced, meticulously researched book, and it engenders challenging questions about who gets to speak and why. But it's a very difficult book to endorse, or to justify. Katharine Coldiron's work has appeared in Ms., the Guardian, The Washington Post, LARB and the Rumpus, among other places. Her novella, Ceremonials, is forthcoming from Kernpunkt Press in 2020. Find her at kcoldiron.com or on Twitter @ferrifrigida.